I was working at a hotel (and living there, planning to relocate) when I started noticing rashes, primarily on my arms and legs after about a two weeks of employment. Suffering minor cases of dermatitis in the past, I thought this was a recurrence of it. The executive housekeeper thought I may have an allergy to the detergent they used to wash the sheets, so she took 2 sets and washed them in hot water and mild soap and left them in my room on the other bed (It was a double room, but I was living there alone). One of the housekeepers told me to look under the seams of the mattress. I did this two days later, late at night, when I was going to change the sheets to the new set, when I saw what looked like rich, black soil on the side of the mattress until I looked closer and the whole mass started to move. The mattress was totally infested with bedbugs. My dad recently brought 2 chairs home that infested our home with bed bugs. The crevices of the bed were covered with little black spots, the bed was also covered. The bugs were visible so I checked my children's rooms. At first I didn't notice or see them on the beds, but after I checked several times I found their beds were badly infected. They were visible and new ones were hatching so I got rid of all beds, all but our clothing. I couldn't throw my kids' clothes away so I washed and dried them lots of times. Our skin still itches a little bit but I'm trying to decide if I need to throw our clothes away. We have put down poison and cleaned but still we itch. Just to let you guys know I have seen and killed a bed bug just now. I realized when I saw four spots behind my back, it was very big, not like mosquito bite. It became very big after scratching so I thought of searching on google what actually are bed bugs, and the symptoms of its bite. Then I realized that it was bed bugs which bit me and not mosquitos, so I actually saw an image and where to find it. What I did was, I got up put the mattress upside down, took my magnifying glass and started looking for any kind of insects in my bed and then I saw an insect red in color with some different colors, small in size. So I just took it down and tried killing with a pen, it was so hard couldn't believe. I tried once again and killed the bug but you know, the moment I crushed the bug it was too smelly. So now I started searching for other bugs but couldn't get any. My former employer had bed bugs from time to time and, yes, I've seen them. If not for their amber color, they look very much like dog ticks. 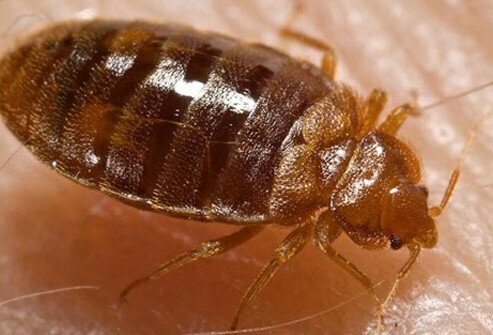 Fortunately, with frequent treatments, bed bugs were eradicated from the workplace. Buy Persil laundry detergent and mix in spray bottle with 90 to 95 degree water, 1 part Persil and 4 parts water; meaning 4 oz. Persil and 16 oz. water. Mixed and shaken it kills bedbugs on-site. Buy diatomaceous food powder. Sprinkle everywhere. Kills them in 48 hours. Wash and dry everything on high heat for 45 minutes. Buy mattress and pillow covers and bag everything unused and tie it up. Repeat this every 2 days and bedbugs will be gone within 6 months. But wait a year to be sure. Good luck! I moved into this house and we live near the hill in California. We moved into this house about a month ago. We bought a bed from a neighbor, it was used. I don't know if it was the house or the bed but suddenly I am getting itchy at night. I feel as if something is crawling up my leg, also I feel like a vibrating sensation wherever the thing is, but I pulled the covers back and nothing is there. I have looked at the mattress, looked at the carpet, looked at the sheets, and I can't see anything, but I do see a little green, the color of jade; jade green specks everywhere. I just can't figure this out and everybody is starting to think I'm crazy. I use Off insect repellant and it stops. I'm going to fumigate the room with something that kills bedbugs, lice and fleas and I'm hoping that will take care of it, but I sure would like to know what this thing is. When the bedbugs start crawling and biting, I feel for them and pull them off me. At the shelter in Salt Lake City, they are even on humans. We carry them everywhere we go. To the next homeless shelter to the next. I have bites all over the arms, I've been to the doctor and was treated; he said I was allergic to something. Now I have found bugs in my bed, I need to know how to get rid of them inexpensively. I live in apartments. I have been tormented at night with what seems like my skin crawling and itching. I have also thought that bed bugs could not be seen. Not according to what I have read at this site. I don't know what my problem could be. I have been finding 2-4 adult bedbugs in sheets last 3-4 mornings. I squeezed them and left lots a blood. I don"t find bites on me but. Bed bugs are in homeless shelters in Grand Concourse. The staff bombed my room after I told them, with my clothes not being wrapped up. I'm about to move and now have to worry about carrying the bed bugs to my new place. I have been severely bitten by bedbugs. My husband and I stayed in a "quaint" old hotel in Maryland. After one night, I awoke to "mosquito like" bites near my wrists. Didn't think too much of it, but as days went on I kept finding more bites, fearing "hives" researched and decided it was definitely bedbugs. Puzzling that my husband did not get any bites! Now I have swollen bites, itching and some deep pain. Treating with Benadryl, hydrocortisone and rubbing alcohol. Alarmed to read that bites will develop for as long as a week from original episode. I have called the hotel, but they assured me they had vacuumed the room! i was in a house that was infested and i think they traveled home with me. I was sitting in my bed and noticed something crawl on my bedspread and sure enough IT WAS ONE. I freaked out and stripped my bed and then began to look on mattress and FOUND ANOTHER ONE. Both were small for the most part. I'm concerned if there are more? If i found only two, does that mean there is more? I bought a new box spring and mattress earlier this year. Both my husband and I have noticed tinges of blood on the linen and also small bites on my ankles. While changing the sheets today and accidentally pulling the mattress off of the box spring we discovered the box spring is infested with bed bugs! We are staying at a hotel in Worcester, MA and we are pretty sure we found a bed bug!!! I've seen bed bugs. To me, they looked like little walking apple seeds! What symptoms and signs did you experience with bedbug bites?